Though authorities ordered a rabies test on a bat that bit a 6-year-old girl near Magic Reservoir earlier this month, incidence of the disease among bats in Idaho is rare. As is the case with most bats that are tested after coming into contact with humans, the bat at Magic tested negative. Due to its many miles of breeding areas for aquatic insects and its proximity to lava tubes suitable for winter hibernation, the Wood River Valley is prime bat habitat. Rita Dixon, state wildlife action plan coordinator with the Idaho Department of Fish and Game, said almost all of the state’s 14 species of bats can be found in the valley. “If you come out around dusk, you’ll see congregations of bats anywhere you have water,” said Ross Winton, nongame biologist for the department’s Magic Valley Region. Those encounters can provoke concerns about rabies. According to the Idaho Department of Health and Welfare, there have been six cases of rabies in bats reported throughout the state so far this year; none was in Blaine County. Since the department began collecting data in 2008, there have been 84 cases of rabid bats reported; four were in Blaine County. State Deputy Epidemiologist Leslie Tengelsen said that unlike most areas of the country, where the rabies virus maintains itself in populations of foxes, raccoons and other mammals, in the Northwest, bats are the only natural reservoir for the disease. However, they can pass it on to another animal by biting it. Despite the disease’s rarity, health officials urge people to avoid any physical contact with bats. Winton recommends that in any incident of a bat bite, the animal be captured and brought in for testing. He said the bat should be captured alive since test results become less reliable the longer the bat has been dead. Dixon said rabies incidence among bats is about one-half of 1 percent, and pointed out that animals with rabies don’t live very long. “They’re not flying around biting people,” she said. Tengelsen recommended that owners of dogs, cats and horses have their animals vaccinated for rabies. Dixon noted that cats are responsible for killing many bats, as well as other small wild animals. She said cat owners who find dead bats on their property should not handle them without gloves, just in case the bat does have rabies. Despite the small hazard they pose to people and domestic animals, bats are considered beneficial to human society. Among those, she said, are Mormon crickets and other agricultural pests. Without bats, she said, many farmers would have to apply a lot more pesticides. That appreciative view is not held by some homeowners who aren’t eager to share their abodes with roosting bats. “They can eat their insects somewhere else,” said the owner of one home in West Magic, after having dealt with hundreds of bats roosting above her patio and in her attic for more than a decade. She said she was told that it would cost about $5,000 to have the entire colony moved out. Instead, she said, she had a screen installed around the patio. Dixon said all but two of Idaho’s bat species live in the state year-round, and hibernate from mid-October to April. Silver-haired and hoary bats migrate to states in the Southwest, where they roost in trees. Winton said the most common bats in the Wood River Valley are the silver-haired bats and two species of little brown bats, which are only about 2 inches long. He said most Idaho bat species are small, and all eat insects. Though it has not reached Idaho, a disease called white-nose syndrome is a threat to hibernating bats nationwide. Since it was first discovered in New York in 2006, the fungus has killed about 6 million bats, and biologists warn that it has the potential to cause the extinction of several species. The disease has been moving to the west and south, and has reached the eastern Midwest. Dixon said biologists are uncertain whether its arrival in Idaho is inevitable. She said that in limestone caves in the East, bats congregate in the hundreds of thousands, while in Idaho the largest known congregation is 2,000 animals, in a cave in the eastern part of the state. She said the smaller congregations might inhibit spread of the disease. Dixon urged that anyone who finds five or more dead bats in one spot report it to the Department of Fish and Game. 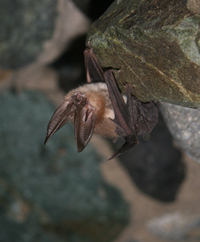 In July, the department was awarded a federal grant of $44,475 as its share of a half-million-dollar fund distributed among eight Western states to implement the North American Bat Monitoring Program. According to the department, there has previously been no coordinated effort to measure bat populations in North America, despite many threats facing them, including white-nose syndrome, climate change, habitat loss and energy development. Winton said wildlife biologists have a hard time tracking bats’ nocturnal activities, and don’t know exactly where most of them hibernate. “There are a lot of things we still don’t know about these critters,” he said.